MARCH 23, 2013 DENTON, TX — The Nighthawk Composite Squadron stationed in Denton purchased a new Direction Finding Receiver with a grant provided by the Denton Benefit League. 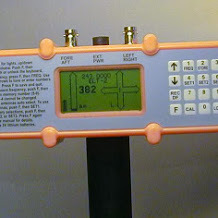 The Direction Finding receiver manufactured by L-Tronics is specifically designed to locate aircraft Emergency Locator Transmitters (ELTs), marine Emergency Position Indicating Radio Beacons (EPIRBs), and Personal Locator Beacons (PLBs) carried by hikers, campers, pilots, and others. It can also be used in other services, such as finding scientific research transmitters. Whenever the NOAA Search And Rescue Satellite Aided Tracking system picks up an emergency locator signal in our area (ELT on an aircraft, EPIRB on a boat or PLB on a person), the Squadron gets a call from the National Rescue and Recovery Center to dispatch a search team either using the squadron aircraft stationed at the Denton Airport or a ground team. Utilizing radio direction-finding equipment, the plane or ground team searches for and locates the signal source, and then either handles the situation or guides other first responders to the site, where they can provide on-site rescue. In the case of a false alarm, the owner is located to shut down the signal. The Nighthawk Squadron, which is made up of over 100 volunteers, spent a weekend training members on the new equipment and has placed it in to active service.